Every year in fitness, there are new inventions or class ideas to bring a fresh perspective to one’s workout. In the last several years, Standup Paddle Board Yoga is one of those “fresh inventions” to where the board is your mat, and nature is your focal point. Plus, the combination of paddling to and from the practice location produces a full-body workout all while keeping the core strong and stable to avoid falling off the board. WASUP Yoga, located in the Ballard neighborhood, conducts seasonal stand up paddleboard yoga. Established in 2011, lead instructor, Hasna, met Andrew Drake while shopping for a bathing suit at the existing Surf Ballard. Drake, interested in offering yoga classes, and Hasna, current yoga instructor, exchanged business cards and organically created Washington Standup Paddleboard Yoga. Standup Paddle Board sizes various amongst different lengths and widths, which is dependent upon the weight and skill level of the individual. Typically, the novice requires a longer and flatter board to offer more stability. In addition, standup paddles contain an “elbow” in the shaft to maximize efficiency with each stroke. Whether you are sitting at a desk or standing a paddleboard, posture is key to almost every activity in life. Paddlers must keep toes facing forward, feet hip distance apart, soft bend at the knees and chest upright with strong and broad shoulders. Similar to riding a bike, once forward momentum increases, so does stability. Yoga on land versus the board differs greatly. First, the movement of water below the board consistently challenges the balance and the frame of mind. 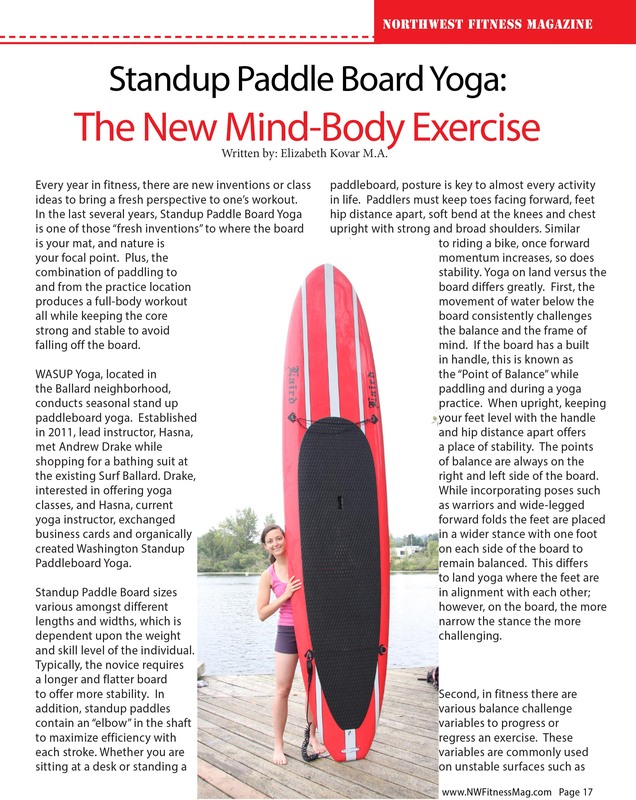 If the board has a built in handle, this is known as the “Point of Balance” while paddling and during a yoga practice. When upright, keeping your feet level with the handle and hip distance apart offers a place of stability. The points of balance are always on the right and left side of the board. While incorporating poses such as warriors and wide-legged forward folds the feet are placed in a wider stance with one foot on each side of the board to remain balanced. This differs to land yoga where the feet are in alignment with each other; however, on the board, the more narrow the stance the more challenging. Second, in fitness there are various balance challenge variables to progress or regress an exercise. These variables are commonly used on unstable surfaces such as the same knowledge is applicable to paddleboards. These balance challenge variables include: contact point, visual affect, movement and external stimulus. -Contact Points refer to anything that supports the body to remain balanced. On the board this may include body parts or the paddle. The more parts of the body that remain on the surface of the board, the better the balance, which also makes the exercise easier. In addition, incorporating the paddle in an exercise to where it touches the board will add another contact point to assist the balance. -Visual Affect in exercise stimulates the proprioceptive and sensory receptor systems due to the fact that the visual feedback has been eliminated. Yogis may incorporate visibility or focal points to aid or challenge the balance. The focal point concentrates on one spot, which assists in balance; where as watching a boat motor on by challenges balance and concentration. The other visual affect is visibility. Dirty sunglasses or closing the eyes completely increases the balance challenge while relying on the sensory organs. Movement refers to the range of motion of an exercise, which may incorporate low or high degrees of motor skills, which challenges the balance. On the board, not only are there challenging yoga exercises that require more movement, but the movement of the board itself adds another dynamic of mental concentration and physical control. -External Stimulus refers to any outside force exerted or used during an exercise. In paddleboard yoga, incorporating the paddle with poses will increase the balance challenge. For example, when in tree pose, raising the paddle overhead utilizes concentration to balance and maintain strong arms overhead. In addition, strong wind may act as an external stimulus, which creates the body to want to move away from the center of gravity and balance point. Finally, going beyond the four walls of a room instantly incorporates an assortment of views all while connecting with nature. “Every class is different. You are part of nature during this experience and some days you see seals, salmon and bald eagles. Some days the weather is better than others, but we embrace the Seattle weather.” states Hasna. In one word, Hasna describes the experience as “esoteric”. Beyond a physical practice, there is a deep connection, with yourself or possibly the earth, during a SUP yoga practice. “Connection is the number one thing we seek all the time. When we are peaceful and serene we are in connection. When we are stressed and distraught, we are disconnected.” The connection naturally happens without trying. During my experience, I was enthralled, while in a forward fold, that the water was actually the sky. It was surreal and felt like a dream. Novice and experienced paddlers and yogis are welcomed to classes. “Small progressions make the class successful. For beginners we start slowly to build confidence before moving to your edge.” From relaxing to advanced poses, students can go “full board” in their practice, as long as you are willing to experience the water if the balance nose-dives. Got fear of the water? “Seeing vast expansive water maybe scary, but it is important to comfort people to the board and exercise.” Students must remember that they are able to create their practice to cater their desire or ability. “We are able to see student’s fears, and the instructor must help recognize it and move that fear toward intention.” claims Hasna. Plus, instructors of paddleboard classes are not able to coast along with only instructing yoga asanas. “Instructors must analyze the weather patterns such as the currents, tide levels and winds.” states Hasna. Hasna hires instructors who are friends or within her yogic network. Paddleboard yoga brings a fresh perspective to working out. In my opinion, it definitely beats staring in the mirror with a set of dumbbells in hand, Happy paddling. Elizabeth Kovar M.A, personal trainer and yoga/fitness instructor, earned Yoga Alliance 318 hours in Ashtanga yoga & Chakra Meditation from the Ayurveda & Yoga Retreat and Hospital in Coonor, India. She studied yoga in five different countries, and learned through some of the best names in the yoga industry. Her Master’s Thesis “Creating Yoga Programs for People with Movement Disabilities” was implemented on a 12 week research study for people with Stage 1-2 Parkinson’s disease with the University of Toledo Physical Therapy and Neurology Department. She resides in Seattle, WA and is the fitness coordinator at the City of Lynnwood Recreation Center. Elizabeth is also a freelance fitness / travel writer, workshop presenter and instructs an online Yoga 1 & 2 course for Walla Walla Community College.